Bakers Pride Radiant Char Grill L-24R 24″ Heavy duty counter top radiant gas chargrill, with low profile design, is only 403mm high to the grilling surface making it ideal for use on refrigerated base counters. Fitted with cast iron cooking grates which have a choice of 3 height settings. Low Profile Counter Top style char broiler is designed for high volume char broiling in natural or LP gas. 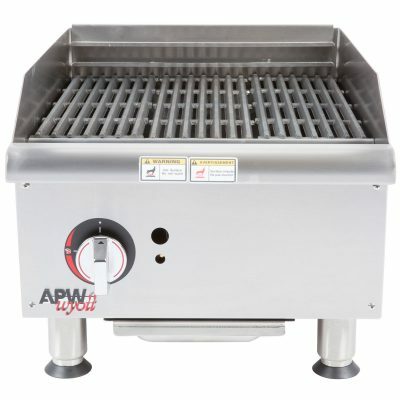 L-R Series includes 14gauge stainless steel radiant above each burner for maximum heat distribution to cooking surface.